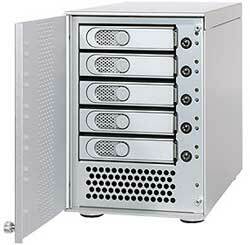 Sonnet has a new rebate offer promoting their Fusion D500P five-bay SATA RAID box for road and office use. Buy the box plus a SATA card for your desktop and an ExpressCard for your laptop and get a $130 rebate. Seems like a nice deal if you are in the market for such a device before August 31, 2007. I set up one of these Sonnet boxes for a client several weeks ago and it was a very user-friendly system and speedy in performance. I think this is a pretty nice SOHO or small business RAID box, yet it goes far beyond “basic” with speeds in excess of 200 MB/second.